We have fantastic children at St. Joseph's who are keen to participate fully in the life of the school. We are the School Council for the pupils of St. Joseph's. There are two representatives from Year 2 upwards elected on the School Council. The children elect their own class representatives, with new committee members each year. We represent the views of all the pupils, with the aim to improve our school. We have a Chair, Vice Chair and Secretary of the committee. We meet regularly and through our work changes have happened. After a meeting we give feedback to the school during an assembly and at times ask them for their support. We have an active Chaplaincy Group in school that enhance our prayer life, Liturgical Celebration, Collective Worship and whole school celebrations. The group comprises of children from across Key Stage 2 who were voted for by their peers. This is a role undertaken every year by Year 6 (some schools also train the Dinner Ladies to become Super Play Leaders and this is something we may look at next year). The pupils follow a weekly rota. They have a bag of Super-Play equipment that they distribute to the children during Lunchtime play. 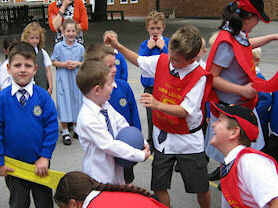 They supervise the children with the equipment and should ensure all children share the equipment. They wear Super Play Leaders bibs and caps. Junior Road Safety Officers are selected from Year 6 pupils. The class votes for who they think will fill the role successfully. At the start of the school year, two pupils are selected to take part in a training event in Leicester at County Hall with other JRSO's from the area. They have responsibility for the JRSO notice board during the year. They organise the Annual JRSO quiz in Key Stage 2 and competitions for both Key Stages. 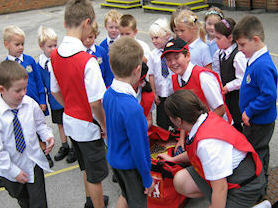 Part of their role is to ensure the school community is aware of Road Safety developments.